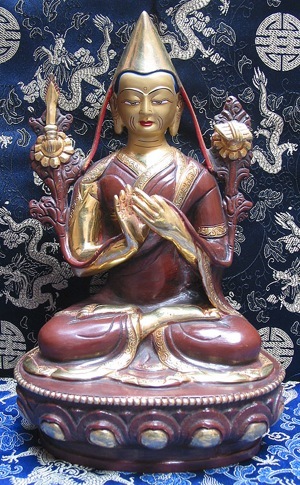 NKT professes that it is the (only) pure lineage of Tsongkhapa's teachings. However, Tsongkhapa (1357-1419), one of the most prolific Buddhist teachers in history, never taught Shugdenism, a mythology that did not begin until a couple hundred years after his death. According to Shugden mythology, Shugden emanated as a terrifying spirit from the murder or suicide of a disgruntled individual bypassed in the selection of a previous Dalai Lama. Beginning with Pabongkha less than a hundred years ago in Tibet, Shugen was deployed against those disagreeing with the hegemony of a ultra right wing sect within the Tibetan Gelug school. NKT now leads this tradition, calling its battle The New Kadampa Tradition. "However, it is a measure of profound sorrow that a so called “Geshe” Kelsang Gyatso and his English supporters have embarked upon a ruthless smear campaign to tarnish the International stature of His Holiness The Dalai Lama in the name of alleged “religious persecution”. It is nothing short of blasphemy in the eyes of the overwhelming majority of the six million Tibetans. It is nothing but a crude form of debasing the Dalai Lama for his own selfish ends...We have nothing but pity for your ignorance...Why not mind his own business and do what he likes in his own bigoted kingdom? These days, [in Kelsang Gyatso] the demonic cloud of overwhelming arrogance displays itself with a mass of deluded pride, like a bat who thinks he is above the sky…. This demon with broken commitments…. burns with the flame of unbearable spite towards the unsurpassed omniscient 14th Dalai Lama, the only staff of life of religious people in Tibet, whose activities and kindness are equal to the sky. We advise him to accept the fact that he is an ordinary being and stand no chance whatsoever to challenge the Dalai Lama. He is not even a Geshe. The so called “third Buddha” is a figment of imagination conjured up by his fawning disciples as a propaganda tool to attract more people to his centre and that it should not go to his head. Kelsang himself has transgressed the eight shortcomings of relying wrongly upon his own spiritual master H.H. The Dalai Lama. According to the circular released by the Sera Jhe Tsangpa Khangtsen, to whom Kelsang belonged, he had received both sutra and tantric teachings from H.H. The Dalai Lama when he was in Tibet. He had received the fifth Dalai Lama’s Lamrim Jampel Shalung at the Norbu Linka summer palace and the Kalachakra Initiation in 1956 from H.H.The Dalai Lama which incidentally was the first Kalachakra initiation by the fourteenth Dalai Lama. As it were, there is simply no question of his not being a disciple of H.H. The Dalai Lama but he has ignored this aspect and launched a blistering attack on the Dalai Lama in the name of “religious persecution” along with his gullible followers. The outcome of all this attempt to denigrate the person of the of Dalai Lama by Kelsang clearly transgressed his spiritual relationship with the Dalai Lama and though he has mentioned in his letter that “all of us are destined to go to hell”, we are in no doubt that he will in fact be the one who will land in hell. We have therefore stripped him of his membership from our Sera Jhe Dratsang since the holy scriptures have clearly prescribed to evict such apostates who will foul the Sanga community’s spiritual purity and serenity and will have a negative influence for the whole community. Owing to the above reasons contained in the holy Tantric treatises, the Sera Jhe Dratsang’s Abbot and ex-abbots, Reincarnations of holy Lamas, Geshes, and the House Masters of the fifteen different Houses unanimously decided to strip Kelsang Gyatso of his membership in the Sera Jhe Dratsang and his own House had earlier done the same. His hatred towards the Dalai Lama obscures him from seeing any merit of the Dalai Lama...It is not the fault of the holy Buddha, nor Lama Tsongkhapa nor H.H.The Dalai Lama but the beholder like Kelsang Gyatso whose demonic instinct get the better of them...He is an object of pity and nothing else. What’s more, if any one disagrees with his “pure” cult, he gets the boot. The sacrilege he was committing by banning the photos of the Dalai Lama and even the utterance of his name in the premises of his cult kingdom. It is an unheard piece of news which every Tibetan will condemn with the severest indiction. The motivation behind this act was, he was now planning to wean away innocent, unsuspecting, young minds towards his cultist school called the “New Kadampa Tradition” which imposes a ban on Tibet’s Spiritual and Temporal leader the Dalai Lama and thus undermine his authority even in the exile community. In his apparent ecstasy, he even disowns being a Tibetan and works against the very people where he was born. (referring to Gyatso)...Possessed by a terrible demon, without shame, embarrassment, or modesty, he doesn't have even the slightest care or concern for any of the commitments of the three vows [pratimoksha, bodhicitta, and tantric] which he undertook. This means that we request all of our brothers and sisters, the Tibetan people inside and outside Tibet, to completely sever any relationship with him. Concerning the practice of worshiping divine protectors at this Monastery in particular, the protector who was directed by the previous great masters to advise, command, and look after our Monastery is the Dharma protector Dregpa Chamsing [Dregs Pa lCam Sring). Aside from this protector there has traditionally been no worship of Dolgyal [Dorje Shugden]." "According to our information the robed members of this group have not taken monastic vows as defined by the Vinaya which, as I am sure you know, is the collection of teachings by the Buddha that articulate the moral discipline to be followed by the ordained community. The opinion of the ASA is that for NKT members to represent themselves to the public as authentic Buddhist monks and nuns is wrong and misleading." These conclusions, mirrored by consensus of valid Buddhist teachers, establish that Kelsang Gyatso and his followers violate Tsongkhapa's wonderful teachings. This is not to say that most of what Kelsang Gyatso writes in his books westernizing Buddhism is invalid. NKT's defense that Buddhist teachers have supported Kelsang Gyatso's books does not mean that any of them supported Kesang Gyatso's anti-Tsongkhapa enterprise. Furthermore, what Kelsang Gyatso writes and his followers read is rarely practiced by them. Fortunately, there are vastly superior ways to learn about and practice Buddhism than with NKT.